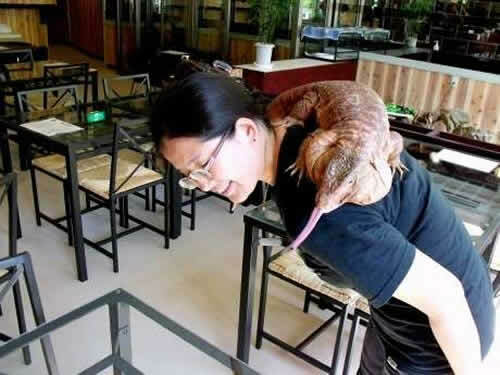 The Land of the Rising Sun is notorious for a variety of wacky venues, like the relaxing cat cafes, or theVampire Cafe in Ginza, but it didn’t have a reptile-themed one. 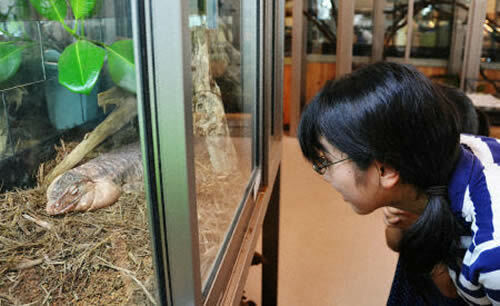 Since a few days ago that’s no longer a problem, as the country’s first reptile cafe opened its doors in Yokohama’s Naka Ward. ”I wanted to create a venue for those reptile fans hiding in the closet to get together and freely talk about the charms of the creatures they love,” Mutsumi Nagano, the cafe’s 42-year-old manager said about his idea. Strangely enough, most of the reptile cafe’s customers are women, and they apparently love observing the various species of lizards and snakes is specially designed tanks and cages. There are around 40 reptiles displayed at the Subtropical Teahouse, including a 1-meter-long lizard and a 1.7-meter-long snake. ”It is hard to keep them at home and we may not be able to get this close to them at zoos,” one of the cafe’s customers said, while taking photos with his camera. Gutsy reptile-lovers are allowed to pet the cold-blooded creatures, but are required to wash their hands on entering and leaving the partitioned-off area.